We’ve come to rely on apps to manage virtually every aspect of our lives. Budgeting apps keep us from overspending. Fitness apps keep us on target. Social media apps keep tabs on our friends. But will a breathalyzer app keep us from getting behind the wheel when we’re too impaired to drive? The Colorado Department of Transportation (CDOT) has answered unequivocally in the affirmative. The CDOT has gone so far as to partner with BACtrack, a company that makes professional and personal breathalyzers, to offer a mobile breathalyzer that wirelessly interfaces with a smartphone app. When connected via Bluetooth, the BACtrack app allows users to guess their blood alcohol content (BAC), then prompts them to take a deep breath and blow into the breathalyzer. Subsequent screens show the user’s BAC and an estimate of when it will return to zero. The CDOT has launched a public service announcement campaign, “Before You Go, Know,” that encourages Coloradans to purchase BACtrack breathalyzers and offers a 20 percent discount on BACtrack products. In Colorado, the BAC limit for a DUI is .08 percent, and the BAC limit for a driving while ability impaired (DWAI) is .05 percent. At first glance, the idea of a portable breathalyzer seems like a no-brainer; look a little closer, however, and serious questions emerge about the efficacy of personal breathalyzers. The current initiative builds on the findings of a survey conducted in the summer of 2016, when 225 random people in the Denver metro area were given BACtrack products in exchange for feedback. Although the CDOT press release headline screamed, “Smartphone breathalyzers lower risk of DUI,” there is virtually no support for that claim. While scientific studies are typically peer-reviewed, the research analysis for the CDOT survey does not appear to be publicly available. Instead, the efficacy of personal breathalyzers was promoted because “84 percent of participants agreed that owning a smartphone breathalyzer lowered their risk for a DUI/DWAI,” and “82 percent agreed anyone who regularly drinks should own a breathalyzer.” In other words, there is about as much scientific validity to the claim as a public opinion poll. There are other ways that the CDOT pilot program strains credulity. A scientific study tests a hypothesis by setting up an experimental group and a control group. In this instance, the experimental group would be those using the personal breathalyzer. A control group would consist of people who do not use a breathalyzer. The only way to determine if the breathalyzer changed behavior is to compare the two groups and to ensure that there wasn’t a third factor – called a confounding variable – at play. In this instance, however, there was no control group. Therefore, it’s impossible to assert a correlation – much less causation – between behavior and a breathalyzer. Scientific studies also randomize research subjects, and some go so far as to conduct what are called double-blind studies, where even researchers don’t know which people receive the substance or item being studied and which do not. In addition, the greater the number of research subjects in a study, the more reliable the findings. For their 2016 summer survey, however, CDOT and BACtrack handed out only 225 breathalyzers at a Denver brewery and at the CDOT itself. This hardly constitutes a sample representative of all Coloradans. Curiously, even in the absence of a scientific foundation, the CDOT took their BACtrack partnership a step further this summer, distributing smartphone breathalyzers to 475 Coloradans who have been convicted one time of driving under the influence. According to the CDOT’s press release, the agency is not actually seeking data on whether or not the use of a personal breathalyzer impacts subsequent DUI arrests or convictions. Instead, they are surveying users about how users feel the breathalyzer influences their behavior. In addition, CDOT is keeping a log of the user’s BAC, time, and location every time the breathalyzer is used. Yet there is no mandate to use the device, meaning that the data will not reflect every time the first-time offender reaches or exceeds the legal limit; instead, it will record data each time the drinker decides to use the device. Further, the data will only be used in the aggregate, meaning that there is no connection to law enforcement. This could be because Colorado case law and statutes say that preliminary breath testers (PBT) are inadmissible in court, except to determine probable cause, because they are inaccurate. In other words, law enforcement can’t enter the results into evidence to incriminate a suspect, and defendants can’t use PBT results to prove their innocence. This makes the CDOT’s decision to encourage those who have been convicted of a DUI to use a PBT even more perplexing. Beyond the myriad flaws in the CDOT studies, there are issues with the reliability of PBTs purchased online that call into question the devices’ efficacy. For example, BACtrack says that the user should wait 15 minutes after drinking, eating, or smoking to use the device. It is easy to imagine a scenario where people don’t wait and thus get inaccurate readings. In fact, even the CDOT’s video public service announcement depicts people using a personal breathalyzer while they’re at the ballpark, beers in hand. Users of smartphone breathalyzers report glaring inaccuracies. 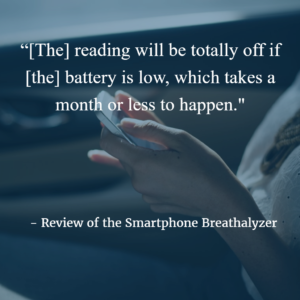 In one review, a user says, “[The] reading will be totally off if [the] battery is low, which takes a month or less to happen.” Other users complain about Android compatibility issues, or that the device continually displays a reading above zero. Sometimes, users complain that the device still reads zero after two drinks, and other times, that the calibrations are simply wrong. It turns out that these issues are just the tip of the iceberg. Chemical and paint fumes can cause readings to go haywire, as can mouthwashes and breath fresheners. Moreover, manufacturers recommend that the user conduct multiple breath tests and avoid “human error.” It is difficult to imagine an alcohol-impaired person successfully navigating technical PBT maneuverings multiple times. It’s much easier to imagine them thinking that it’s simply not worth the trouble. Beyond the finicky nature of PBT technology is the issue that even the most accurate result simply represents a snapshot in time. If a person drank five shots within 15 minutes and immediately used a PBT, their blood alcohol could easily fall below Colorado’s DWAI or DUI limits. On the road a half hour later, and it would likely be a different story. PBT readings don’t take into account the many variables impacting the human body’s rate of metabolizing and eliminating alcohol, such as age, gender, weight, food eaten, and the time period over which alcohol is consumed. Even assuming a device is completely accurate, the person has to take multiple readings over a significant period of time to determine whether their BAC is rising or falling. That’s neither practical nor reasonable. Relying on a personal breathalyzer purchased online to accurately determine BAC seems reckless. The difference between being safe to drive and being impaired is a fine line, one best not left to devices with unproven accuracy or efficacy. Apps are great for many aspects of our daily lives; but entrusting our lives to an app is foolhardy.